Finding the best lock for your bicycle can be difficult. There’s loads to choose from. And the wrong decision can have disastrous consequences! The secret to success is choosing a lock that’s both secure enough to protect your bike and easy enough to use on a daily basis. 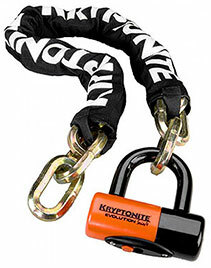 The Kryptonite Kryptolok Series 2 is the archetypal u-lock and a brilliant budget choice. It’s a practical size and weight and offers good, mid-level (Sold Secure Silver) security for a very reasonable price. It won’t provide you with the very highest level of protection, but the 13 mm shackle should withstand all but the biggest bolt cutters. It’s very easy to use, comes with a reasonable frame mount and benefits from Kryptonite’s outstanding after sales service. So, if you’re “Lower Risk” and looking for a dependable u-lock that will fit around almost every bike, this is a great choice. Read my full, hands-on review of the Kryptolok which includes the best alternatives if it’s not right for you. Or compare it to other u-locks. For me, the Abus Granit X Plus 540 is probably the best all round bike lock, of any type, available today! It provides a very high level of security (Sold Secure Gold) and despite being a decent, practical size, it’s still comparatively light. The 13 mm shackle is cast in a patented parabolic square shape from a special type of steel that’s as strong as the much thicker shackles on much heavier locks. 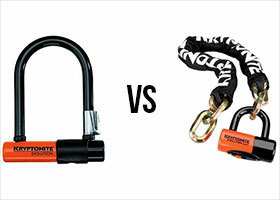 In fact, the Granit X Plus 540 is the lightest, high security, standard sized u-lock available at the moment. So if you’re “High Risk” and looking for a light weight lock without sacrificing either practicality or security, this could well be the best lock for you. It’s not cheap, but in my full, hands-on review of the Abus Granit X Plus 540 I suggest some great alternatives if it’s not quite right for you. You can also see how it compares to other standard size u-locks here. The Kryptonite KryptoLok Series 2 955 Mini is a short, cheap chain which is relatively light and easy to carry wrapped around your seat post. With 9 mm links, it’s not the most secure bike lock (Sold Secure Silver), but it offers far more protection than any cable lock. Just keep it as far from the ground as possible to keep it safe from bolt cutters. So if you’re “Lower Risk” and looking for something practical and reasonably priced to protect a cheaper bike, this could be a good choice for you. I’ve got more about chain locks here. The Kryptonite New York Noose 1275 is great because the noose system almost doubles the usable length of the chain. This means it can be quite short which is important since the 12 mm links put this chain at the top limit of what is practical to carry around daily. However, these 12mm hardened steel links also make it very secure for a portable chain lock (Sold Secure Gold). So if you’re “High Risk” and looking for a high security, portable chain that you can use every day, this could be the right choice for you. Just make sure you’re OK with the weight first. You can read my full review of the New York Noose 1275 here which includes a couple of alternatives if it’s not quite the right lock for you. You can also check how it measures up to other 12 mm chains here. The Foldylock Compact is the lightest folding lock that still offers a reasonable level of protection (it boasts a solid Sold Secure Silver rating). What’s more, it’s also the most usable folding lock I’ve ever tested! The Foldylock Compact is 33″ (85 cm) long, which means it has around the same amount of internal locking space as a standard sized u-lock. But because it’s flexible, it should actually give you loads more options when you’re looking for somewhere to lock your bike. And in fact, at 2.2 lb (1 kg), the only Sold Secure Silver locks that are lighter than the Foldylock are mini u-locks! Compared to it’s nearest rival the Abus Bordo 6000, the Foldylock Compact is lighter and easier to use. It’s easier to unlock, easier to unfold, easier to get around your bike and comes with a better frame mount. Plus it’s cheaper! So, if you’re “Lower Risk” and you’re looking for a compact and lightweight alternative to a u-lock, this could be a good lock for you. Read my hands on review of the Foldylock Compact. The Abus Bordo GRANIT 6500 is the stronger, heavier brother of the 6000. The folding steel plates are just a fraction thicker at 5.5 mm. But it’s significantly more secure with a Gold award from Sold Secure and 2/5 stars from ART. It’s 33.5” (85 cm), which again should give you loads of options when you’re looking for somewhere to lock your bike. And at 3.48 lb (1.58 kg) it’s heavy, but not too heavy. Sure, it’s heavier and less secure than the Abus GRANIT X Plus 540 230 which I think is the best all-round bike lock available today. But it’s much lighter than any Sold Secure Gold chain lock. So if you’re “High Risk” and you need more locking options than a u-lock can give you but don’t want to lug around a massive heavy chain, the Abus Bordo GRANIT 6500 could be a very good choice. Read my full, hands-on review here. If none of my top 6 picks seem quite right for you, don’t worry! If you keep reading, I will guide you through 3 simple steps that guarantee you’ll find the perfect lock for both you and your bicycle. As I’ve already said, the best bike lock won’t just protect your bike. It will also be easy for you to use on a daily basis. Of course your individual circumstances are very important here. They include how expensive your bike is, where and how you use it, and how much money you can afford to spend. Choose the right lock brand. So in Step 1 we’ll work out what level of security you need and I’ll explain how to find locks that will give you the right amount of protection. In Step 2 I’ll introduce the various different types of bike locks and show you how to choose one that suits your individual needs. And in Step 3 I’ll explain how each of the lock brands offers something different so you’re able to choose the right one for you. Ready? OK, let’s get going! The ultimate job of any lock is to stop your bike from being stolen. (Yeah OK, that’s pretty obvious right?!) So the first and most important step is to think about what level of protection you’ll need. How can I know what strength lock I need? If two or more of your answers put you in the “High Risk” column, then you need a lock that will give you a higher level of protection. While if two or more answers are in the “Lower Risk” column, you might be able to get away with a lower security lock. OK, so you’ve got a good idea what level of protection you need. But how can you know which locks will provide that protection? In short, how can you judge how secure a lock actually is? The first thing to remember is that no bike lock is unbreakable. If a thief really wants to steal your bike, with the right tools and enough time, he can and he will. A bike lock just buys you time. And the better the lock, the more time you get. 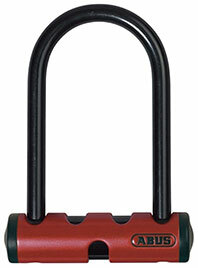 Generally speaking, the thicker a lock is, the better it will resist the various tools a thief might use to attack it. For instance, top of their list of favorite tools are bolt cutters. Bike thieves love bolt cutters! Chain links and U-lock shackles with diameters of less then 13 mm can be cut with medium sized bolt cutters which many bike thieves will use. Locks with diameters between 13 and 15 mm can only be cropped by the very biggest bolt cutters. But there are thieves that use these tools too. But at 16 mm thickness, chain links and U-lock shackles become impossible to cut with any manual bolt cutters. Can be cut by bolt cutters? However, unfortunately it’s a bit more complicated than this. The type of steel, the shape and size of the lock, the locking mechanism and the overall build quality will all affect how strong a lock is. And of course thieves don’t only use bolt cutters. Different tools will try to exploit weaknesses in locks that may be difficult for you to see. Online tests are a bit rubbish! There are tons of different cycling and review websites testing lots of different locks, in order to tell you which ones are the best. But they always test small samples and they all use different tools in different ways. So it’s difficult to compare the results. What’s more, they’re not necessarily attacking the locks in the same way a thief would. In fact, beyond “all cable locks are rubbish” and “an angle grinder will cut through anything eventually” the conclusions they draw are neither certain nor particularly useful. And there are actually some pretty dodgy recommendations made on some very high profile websites. For example I think the top rated lock on bicycling.com is one of the worst bike locks I’ve ever seen. So generally, I don’t trust them! Kryptonite, OnGuard and Abus all use different security ratings. Confused? But they’re all very different so they’re no use if you want to compare locks from different brands. Independent security ratings are best! Luckily, there are also independent, third party experts that use standardized methods to test and then rate a wide range of different locks according to their security. Sold Secure from the UK provide a Gold, Silver or Bronze rating based on how long a lock can withstand an attack. And of all the testers, they rate by far the biggest number of locks. Sold Secure rate locks from Gold to Bronze depending on how long they take to defeat. 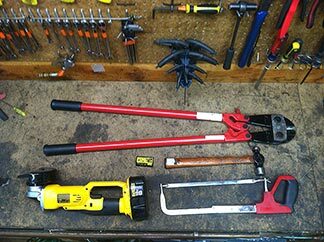 They use a huge variety of tools and methods in their tests including screwdrivers, junior hacksaws, pliers, stilsons, steel tubes, ball-peign hammers, HSS hacksaws, punch sets, club hammers, TCT hacksaws, freezing agents, cold chisels, 24″ wrecking bars, scissor jacks, slide hammers and lock picking tools. I’m not actually sure what some of those tools are to be honest! And they also have close links with the police and insurers which means they get up to date information on the techniques used by thieves and can test the locks accordingly. ART from Holland are the other big tester and they offer a 1-5 rating (5 being the strongest) based on a whole variety of tests performed by both machines (tensile strength, torsion strength, cutting, corrosion, dust and freeze tests) and by test engineers (brute and intelligent attack tests). Neither of these groups rate all the available locks and there has recently been criticism of some of their techniques. However, I think they remain the best comparative measure of security when choosing a lock. What’s more, in the UK at least, most insurance companies will require that your bike is secured with a lock that’s rated by Sold Secure and the level of cover you receive will depend whether the lock has a Bronze, Silver or Gold rating. If you don’t use a lock that is rated by Sold Secure, they won’t cover you. So, considering this and the numbers of locks they test, as a general rule, I recommend that you use the Sold Secure ratings to judge how secure a lock is. If you are “High Risk” according to the table above, choose a Sold Secure Gold lock. 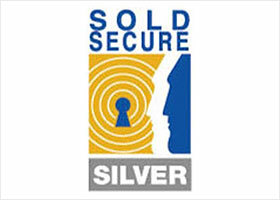 If you are “Lower Risk”, choose a Sold Secure Silver lock. I don’t recommend locks that are Sold Secure Bronze under any circumstances. Sure, if you live in a very low risk area, you might be able to get away with a Bronze rated lock. But they provide very little real protection. And I don’t feel comfortable recommending locks to you that are so easy to defeat. And really, there’s such a huge range of different types of locks at different weights and prices, you should be able to find one that’s rated Sold Secure Silver or better that will suit your needs. It’s worth noting that in order to receive a rating from Sold Secure, a lock must be submitted by the manufacturer. And since they don’t submit every lock, there are some that would be worthy of a Silver or Gold rating that aren’t currently rated. This is where the in-house rating comes in handy. For example, if one OnGuard lock has a Sold Secure Silver rating and a 63/100 OnGuard rating, you can be pretty confident that all their locks with 63/100 are Sold Secure Silver standard. Of course this is no use if your insurance policy specifies locks that have a Sold Secure rating. But if you don’t take out insurance, it’s a useful way to find a Sold Secure Silver or Gold standard lock even if it doesn’t have an official rating. This is almost as important as Step 1. Because the type of lock you choose will determine how easy it is to use. If it’s difficult, you’ll stop using it. And that’s when your bike will be stolen! So it’s important you don’t choose a lock that’s too heavy or too small, that’s difficult to carry, complicated to secure or severely limits the places you’re able to lock your bike. Obviously this will depend on your individual circumstances. But if we look at the advantages and disadvantages of each type of lock it should quickly become clear which is the best one for you. Do not buy a cable lock! 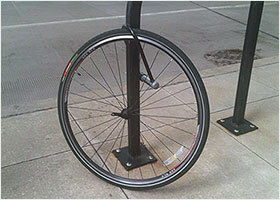 A U-lock (also known as a D-lock) is like a giant padlock that fastens around your bike. Good U-Locks provide a nice balance between price, practicality and security. They are generally cheaper, lighter and a bit easier to use than chain locks, while still offering a high level of protection. Because of their rigidity they can be more challenging to transport than chain locks. And their limited size means you’ll find less things you can secure your bike to. However, in general, if you’re only going to buy one bike lock, these are the locks I would recommend. They range in price from around $30 / £18 for a decent budget lock, up to $100 / £60 for the most secure models, so you should be able to find one to suit your wallet. However, there are a number of things you need to think about carefully when buying a U-lock, including which size and thickness you need and how you’re going to carry it around. You can also read lot’s more about the best U-locks here. Or compare the locks in a big table of the most popular U-locks here. The New York Fahgettaboudit Mini is quite simply the most secure (Sold Secure Gold) portable bike lock available today. It’s small. It’s heavy. And it doesn’t come with a frame mount. But the 18 mm shackle means this lock cannot be defeated by hand tools. Even power tools will take a good long while to get through this lock! So if all three of your answers were in the “High Risk” category in the table further up the page and you’re looking for the very highest level of protection, this could well be the best bike lock for you. It’s not for everyone though. You can read my full review of the New York Fahgettaboudit Mini here, including several alternatives if it’s not right for you. And you can also see how it compares to other mini U-locks here. Chain locks usually consist of a long metal chain (covered by a sleeve to protect your paintwork) and a big lock. those that are so heavy they are best as stationary security (> 12 mm). Portable chains are easy to transport wrapped around your seat post and their relative length means you can secure your bike to a wide range of objects. However these chains will generally be no more than 12 mm thick and are not as secure as good U-locks. And they are still much heavier than U-locks. Chain locks range in price from around $45 / £26 for a short, budget model up to $500 / £200 for the thickest, heaviest monsters. So they’re also a bit more expensive than U-locks. You can read more about the best chain locks here. 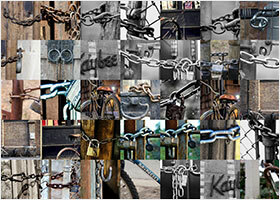 Or compare the locks in a table of the most popular chain locks here. Really, Pragmasis and Almax make the strongest chain locks available today. But since they are not easily available worldwide, the Kryptonite New York Legend Chain 1515 is probably the most secure bike chain that is. With 15 mm links it’s certainly not portable. This is a lock that stays wherever you lock your bike all day or overnight. But if you’re “High Risk” and looking for the most secure chain from a recognizable brand, this may be the best bike lock for you. Read my full review of the New York Legend Chain 1515 here where I also compare it to the alternatives. You can also see how it compares to other heavy duty bike chains here. Folding locks are generally a little bit lighter than U-locks that offer similar levels of security. And their length and flexibility mean that you’ll usually have more options than you’d get with a standard sized U-lock when you’re looking for somewhere to lock your bike. But the best thing about these locks is the way they fold down to make a very compact package that’s super easy to transport. The carrying holster can either velcro around your frame or even better, screw into your bottle holder holes. 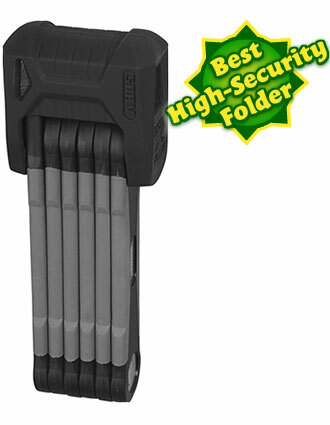 Folding locks are really compact and easy to transport! And because it’s so compact, it won’t work loose, swing about or generally interfere with your ride in the way that U-locks sometimes do. I don’t think they’re as easy to use as a U-lock or chain: unfolding them and then getting them around your bike and the object you’re securing it to can sometimes be a bit of a pain. And because of their comparatively complex build, I have some doubts about how well they’ll continue to perform after a thief has tried (and failed) to defeat them. But if you’re fed up of under performing U-lock frame mounts, folding locks are a fantastic alternative. Up until recently, Abus have dominated the market in folding locks. Indeed, many of the folding locks from other manufacturers offer dubious levels of security. 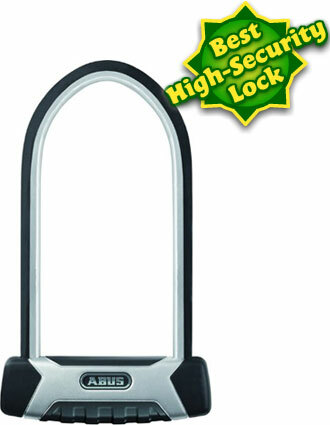 However, Seatylock now produce folding locks that have been rated by Sold Secure too. Cable locks are normally made up of many strands of long, thin steel, braided together inside a plastic tube. your bike is not safe! They’re light, flexible and generally cheap. However, this flexibility means that they’re also soft and almost all cable locks can be cut with a pair of hand held cable or bolt cutters in a matter of seconds. And since the one tool that every every bike thief carries is a pair of cable cutters, cable locks offer very little practical security. Bike thieves specifically target these locks and in fact, some reports suggest than 90% of all stolen bikes were secured with cable locks. So by not buying a cable lock you are already massively reducing the chances of your bike being stolen! You can now buy armoured cable locks which protect the cable by surrounding it with a series of articulated steel barrels. These do offer a higher level of security than regular cable locks. But they are much less flexible and are often as heavy and expensive as chain locks. And what’s more, they are still not as secure as a good U-lock or chain lock. The Abus Steel-O-Flex 1025 for example, is probably the best armoured cable lock available today. But it weighs 4.3 lb (1.9 Kg), is really expensive and there are numerous reports of it being cut. Some people recommend cable locks as a supplementary lock to secure your wheels or saddle. However there are much better ways to secure your wheels and saddle and I really wouldn’t recommend any cable locks in any circumstances. In fact, we can find all the advantages of cable locks in other, much more secure locks. 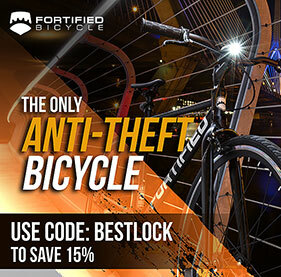 Admittedly not all at once, but at least these other locks will protect your bike! To illustrate this I have selected three locks below that compete well with cable locks in terms of weight, length and price. 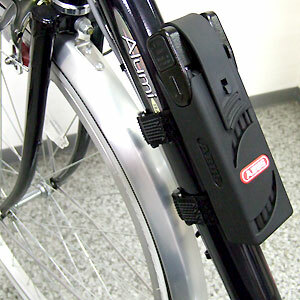 The first is a great lightweight U-lock. The second is a lengthy, but not too heavy chain. And the third is a small, lightweight and super cheap U-lock. The great thing about the Kryptonite Messenger Mini is that it’s small and very light, while still remaining reasonably secure. Although the shackle is just 11 mm thick, it’s made from a special “Max Performance” steel which makes it as strong as Kryptonites other 13 mm shackle U-locks. And this thin shackle means it weighs just 1.83 lb (0.83 kg) which is about the same as two cans of coke. While Sold Secure have not yet rated it, Kryptonite give it a 7/10 which is the same rating as it’s highly regarded (Sold Secure Silver) Evolution range of U-locks. It’s not actually the lightest Sold Secure Silver standard U-lock available. The lightest is the Kryptonite Evolution LITE Mini-6, but the Messenger is slightly bigger making it a bit more practical. So, if you’re a “Lower Risk” according to the table in Step 1, and attracted to cable locks because they’re so light, then maybe this mini U-lock could be the lock you’re looking for! The Abus Iven Chain 8210 85 is the closest you can get to a cable lock in terms of form and function while still offering a reasonable level of security. It’s 33.0” (85 cm) long which will give you loads of options when you’re looking for somewhere to lock your bike. And while at 4.26 lb (1.934 kg) it’s not super light (that’s about the same as 5 cans of coke), it’s still one of the lightest Sold Secure Silver chain locks available. (The other being the Hiplok v1.50). You can see how it compares to other chain locks here. So, if you’re “Lower Risk” in the table at the top of the page and attracted to cable locks by their practical length, maybe this chain lock will suit your needs while also actually protecting your bike! Finally, the Bulldog Mini from OnGuard is small, light and incredibly cheap! It’s essentially a smaller version of the OnGuard Bulldog DT which is one of the best standard sized budget bike locks around. And what’s great about these Bulldog locks is the price. Usually less than $30 / £20 it offers good protection at an exceptional price. These locks tend to be born in the minds of maverick individuals and initially funded through the pages of crowdfunding websites such as Kickstarter. There’s loads of locks to solve loads of problems and they often have little else in common beyond their innovation! Unfortunately many of them have neglected to prove their security credentials (which should really be a priority if you’re trying to sell us a new form of security) and have consequently not been tested and rated by Sold Secure or ART. The TiGr mini is something completely different. It’s made from a single length of titanium, shaped into a bow and secured with a clever steel cylinder. It’s an incredibly elegant design, which uses the natural flexibility of titanium to produce a single piece of metal that’s able to spring open and then close around your bike. It’s also probably the best looking bike lock I’ve ever seen! The TiGr mini has been tested and rated by ART who awarded it 2/5 stars. And this makes it a Sold Secure Silver standard lock at the very least. It’s not cheap. But at 0.9 lb (0.4 kg), it’s 50% lighter than the next lightest lock offering similar levels of protection! The frame mount attaches in the same way as your water bottle cradle, so it’s really easy to carry too. It’s not a lock for super high risk circumstances. But if weight and pure elegance is a priority, then this is a great choice for a lower risk area. Read my full review of the TiGr mini here. The Litelok looks (and works) like a big belt. The strap is made from a special material they call “Boaflexicore” which is both very strong and very light. And the two piece, plastic covered buckle is held together by a 9 mm bolt. The Litelok has been tested by Sold Secure who have given it a Gold rating. And since the Litelok weighs just 2.5 lb (1115 g), this makes it one of the lightest high security locks currently available. In fact, the only Sold Secure Gold lock that’s lighter than the Litelok is the Abus 401 which is a mini u-lock which will offer far fewer options when you’re looking for somewhere to lock your bike. In fact, at 29″ (74 cm) in length, the Litelok actually gives you more internal space than a standard sized u-lock, so you’ll be able to lock your bike in places where you might otherwise struggle even with a normal u-lock! It’s quite stiff so it’s not as easy to get round your bike as you might think and it’s a bit bulky if you want to carry it in a bag rather than strapped to your frame. It’s not cheap either! But the Litelok is a great choice if you want a light weight lock but are not prepared to sacrifice either security or locking options when you’re out and about. Read my full review of the Litelok here. So if we all agree that cable locks are rubbish, how do we choose between a U-lock a chain lock and a folding lock? They are more difficult to attack with power tools, impossible to bolt crop and immune to bottle jack attacks. You can secure multiple bikes with one chain. And they also work well with good ground anchors. Just don’t try to take them with you when you nip to the shops! Since only Abus and Seatylock make decent quality folding locks you’re very limited in your choice. But if you have specific needs that U-locks don’t meet, then consider a folding lock before a chain lock. So, by now you should know what level of security you’re going to need and have a good idea which type of lock is most appropriate. The final step is to decide which lock brand suits you best. There are obviously many, many bike lock brands. But the big three are Abus, Kryptonite and OnGuard. And not only do these three generally provide the best quality, I think that between them they also cover most peoples needs. To give some of the others honorable mentions, Squire make some good quality locks. I like the U-locks from Hiplok and the Pentagon from Seatylock. However, here I’m going to concentrate on the big three: Abus, Kryptonite and OnGuard. I look at the three brands in much more detail in the Abus vs Kryptonite vs OnGuard page (which includes a very detailed review of the different “Anti-theft Protection” schemes). But I’ll also provide a quick summary here. Abus produce the best quality locks. They are well made, endlessly tested, very reliable (even in poor weather conditions) and will last a long time. They also have the best strength to weight ratio. However, they’re the most expensive of the three brands. So if you want the very best quality go for Abus, if your looking for the best price go for OnGuard and if your looking for the best customer service go for Kryptonite! 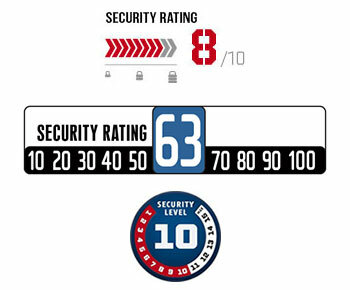 The best way to judge the security level of a lock is to look for a Sold Secure rating. Sold Secure award locks Gold, Silver or Bronze ratings, based on how long they take to defeat. How do you know which rating you need? Just answer the questions in the table below. If two or more answers put you in the “High Risk” column you should probably look for a lock that’s Sold Secure Gold or equivalent. If two or more answers put you in the “Lower Risk” column then you can probably get away with a lock that’s Sold Secure Silver or equivalent. If you’re looking for a portable lock that you’ll carry around on your bike every day, you’re probably best off with a U-lock or a folding lock. U-locks offer a great balance of price, practicality and security. And there’s a huge variety of sizes, weights, security levels and prices and to choose from, so you’ll nearly always find one that meets your requirements. However, in some circumstances, the limited size and rigid shape of U-locks can make it difficult to find places to lock your bike. And the frame mounts that come with U-locks are often frustrating to use. In these cases, a folding lock is a good alternative. The extra length and flexibility will give you more options when you’re looking for somewhere to secure your bike. And because they fold up to such a compact size, they’re easy to attach to your frame and don’t interfere with your ride. They’re also much lighter than chains! However, since Abus and Seatylock are the only companies making decent folding locks you’re pretty much limited to the two locks I review above! If you don’t think U-locks or folding locks will meet your needs, then a portable chain could be the answer. But be aware, chains that offer a decent level of security are much heavier than U-locks or folding locks. However, if you’re just looking for a stationary lock to keep wherever you leave your bike for long periods of time, then a thick chain is the best choice. Not only are the very thickest chains the most secure way to protect your bike, they also work better with ground anchors in shed and garages. There are so many lock brands to choose from these days. And a lot of the locks are of both poor build quality and low security. To keep it simple, I like to stick to the big three: Abus, Kryptonite and OnGuard. And I honestly think that between them, they can provide something for everyone. If you want the very highest quality then go for Abus. Just be aware that you’ll pay a little bit more. If you’re on a tight budget, then OnGuard locks are usually the most competitively priced. Just bear in mind that their customer service is not always so hot! And If you want the very best customer service go for Kryptonite. The quality is not quite as high as Abus and the prices are not quite as low as OnGuard but the after sales service is second to none. If you’re thinking that a U-lock is the way to go, but you’re not sure about sizes, check out this guide. Once you’ve got a better idea which is appropriate, you can compare loads of different U-locks in this table. If you’re leaning towards a folding lock, then it’s probably just a case of choosing between the different Abus models above. And if you’re thinking a chain lock is the best option, then I have a more detailed guide here and a huge comparison table here. How much money should I spend on a bike lock? It’s the same as anything else really. Generally, the more money you spend, the better quality the lock and the more difficult your bike will be to steal. Many lock brands suggest spending 10% of the value of your bike on your lock. But if you have a $200 bike and you only spend $20 on the lock, you’re asking for trouble. So I recommend you spend as much as you can. This will give you the best protection you can afford. And it will also give you the peace of mind that you’ve done the best you can to protect your bike. And don’t forget: a good bike lock can last many years and many bikes. Maybe you’ve got a cheap bike now but if you upgrade to a better bike in a couple of years, you wont need to shell out again for a better lock as well! I know that buying a bike lock is not very exciting. And it’s galling that you have to spend so much money to protect your stuff. But a cheap lock is a false economy. Because when your bike is stolen, you’ll have to buy a new bike and a new, better lock. I learned the hard way, but surely it’s better to get it right first time! Do I need more than one lock? Possibly. In most cases one lock is only going to secure the frame and one wheel. What about the other wheel? What about your seat? If you don’t want to lose them, these should be secured too. The safest way to protect your second wheel is a second lock. And there’s also an argument that a second lock of a different type to the first will further deter a thief because they’d need to carry two different types of lock breaking equipment. Two different locks = highest security. But they’re heavy and difficult to carry. However even a small, decent second lock will significantly increase the weight you’re carrying around and you’ve also got to find space in your bag or on your frame for that extra lock. And this can be a real pain! First of all they’re much, much lighter. And of course because they’re already attached to your bike, you don’t have to worry about how you’re going to carry them around anyway. Secondly, you don’t have to go through any extra locking up steps. They’re always securing your stuff. This makes locking your bike much quicker and easier. Anyone whose ever wrestled with one of those thin cables (which won’t protect your wheel anyway) know what I’m talking about. And thirdly, because you don’t have to worry about your wheels, you can get a smaller, lighter primary lock and actually keep it further from the ground where it’s much safer from attacks. So your whole bike is actually more secure. This is especially useful if you’re using a chain as your primary lock. If you only have to secure your frame, you can use a much shorter chain, which will be much lighter. And wrapped tightly around your top tube it will far enough from the ground to be safe from bolt cutters. You can get secure skewers and bolts for pretty much every component on your bike. They’re not super cheap but they’re no more expensive then a decent mini u-lock. And they’ll make your life much easier. Read much more about wheel and seat protection here. Once you’ve bought a lock, don’t forget to look after it! Clean it with WD-40 and lubricate it with TriFlow or Finish Line every few months, and it will last many years and maybe many bikes too! But if it does get stuck, check out my guide to fixing a jammed lock here. I have tips on how to prevent your wheels and seat being stolen including both DIY techniques and secure skewer reviews. I have the ultimate guide on how to lock your bike properly, where I talk about street, work and home security as well as recommending some good ground anchors. I have article on how to choose the best bike insurance including a discussion of whether we even need it and an investigation of the various alternatives. Hi, Carl, great site, it really helped me choose the locks I’m currently using! I would just like to leave my experience with my security options over the last few months. I live in a major metropolitan area and bike theft here is a real problem, so I usually need very high security, even though I don’t ride a very expensive bike (and I think a beater bike is better and safer to ride around in the city). I use pinhead nuts on my wheels and seatpost, and I further secure them with ottolocks. As a primary lock, I’ve been using the Abus granit 54 mini for the frame, and when I feel I need more security in some areas of the city, I take the Kryptonite NY Standard. So far everything has been going pretty well, haven’t had any problems. Thanks again for helping me decide which locks were better for me! That sounds like very secure and sensible combination! Right now I’m using the HipLok 1.5 and Knog Strongman, as my main high security locks. I also have a Kryptonite Series 2 and a Knog Kabana cable sausage lock for the front wheel and frame. But downtown for a long lockup I’ll use the hiplok for front wheel and frame. And the Knog Strongman for the rear wheel via sheldon brown method. I liked the frame mount for the knog way better than anything kryptonite was using 2 years ago. And it’s hard to find a nice wearable chain by krpyto also. Although their new Mini Messenger double deadbolt locks look very sick. Thank you for your research and thoughtful overview. I hope to improve its utility. In multiple places, you mention the inconvenience of carrying U-locks. To maximize accuracy that statement, you should always mention HipLok for offering a likely exception. For anybody who rides while wearing any type of bag or belt, a HipLok DX is more convenient to carry than most folding locks. The DX requires no janky frame attachments, and it is awarded the Sold Secure Gold status at 1250 grams. I would call that a winning combination of attributes for *most* bike commuters. For the record, I am not affiliated with HipLok, nor have I received any favors. I have tested the DX for usability, but never owned one. My personal lock is actually made by TiGr, a light weight, 24-inch bow lock. It just happens that I can run it up through my downtube’s bottle cage and lock it over my top tube for a perfect and convenient fit on both of my bikes. That’s just lucky. YMMV, and probably will. Back to the subject of U-Lock convenience, there is also the ‘convenience exception’ of a U-Lock which fits in the rear pocket of men’s jeans. Personally, I think this convenience is irrelevant because of the security compromise. I do not want something heavier or less portable than a titanium lock if it is *also* easier to cut. There is a class of U-Locks which can be cut very easily with large bolt croppers, and I have not found ANY U-Locks outside of that class which fit in my largest dude-pockets. Fancy metals with 11-mm cross sections are still highly vulnerable. Your Kryptonite example is rapidly cropped in many test videos. It might really be “as strong as Kryptonite’s other 13mm shackle U-locks,” but measurements like tensile strength do very little to resist cutting. In contrast, the HipLok DX Shackle is 14mm thick. On the downside, I have not found any 3rd party tests recorded for that lock, despite its laudable independent security rating. I’ve just written a review of the Sold Secure Gold Hiplok DXC, and I really like it! Great resource – thanks so much for the hard work. I have a number of bikes but even more varieties of locks. I find they break down into Locks Used at Home/work (or static – that is, the locks never go anywhere), Mobile Locks and Locks That Never Get Used. The static locks are used on bikes in the garage or shed. The bike goes out, but the lock stays there. The Locks That Never Get Used are the odd ones, like the Seatylock integrated seat/lock that I backed on Kickstarter, the three Tigr locks that I backed (starting to see a trend?) and the folding locks. Everyone has their own situation to consider, but I ride in London or in the countryside. In London, I ride a mid-price singlespeed with nutted wheels. Bicyclebolts offers inexpensive security nuts (as well as pinhead socket cap screws for parts) that secure the wheels at a reasonable cost. You could spend €120 for HexLox’s version, or try and use Kinmar security nuts (the special socket weighs a ton, though). Glue in a few ball bearings and that’s pretty secure, or “more trouble than it’s worth”. I lock the frame with a Kryptonite U-lock (I like their frame mount). In the country, the bikes I ride are more valuable, but I’m not about to lug a heavy lock. Then again, the chance of coming across your tooled-up dedicated Urban Bike Thief are pretty small. More likely you will find the Thief of Convenience – no tools but a criminal mind. For them, a simple cable (!) lock is probably enough. I actually use a cheap-as-chips Abus lightweight chain lock (slightly harder to cut through). And of course the bike is hardly ever out of sight and if so for five minutes at most. So far so good. So, I’d say *any* lock is much better than no lock. I think a lot of bikes reported stolen are either not locked at all or locked incorrectly (like the ones you see locked to themselves but not even securing the wheels from turning). Please could you do something on security wheel skewers for bikes. I can’t find any independent tests or objective opinions on the best options. I do cover them quite extensively here. Yes: it’s very insecure. I wouldn’t use it under any circumstances! The Kryptonite chain is definitely the better of the two. Because the cable is a very very bad lock! But even the Kryptonite Keeper is a little thin for my liking. I’d be tempted to go for the thicker Kryptonite Kryptolok 955 Mini instead. I can’t find any 16 – 18 mm cable locks that come with Kryptonite u-locks. Usually they’re 10 mm. But even at 18 mm they’re useless as a pair of hand held cable cutters can just chew through them! I would steer well clear! Truly excellent site! Lots of valuable information here and your time is truly appreciated. I have a question for you. I was considering purchasing the New York Legend chain with the padlock along with a ground anchor by either Kryptonite or Abus to lock up our bikes in the back yard beside our house under a patio. There is a fairly high secure fencing that goes completely around the house in the back.. However, I was recently thinking that since we have 4 bikes in the family perhaps running the chain around the upper frame of all 4 bikes and leaving it at that may be just as secure as a ground anchor since with the ground anchor the chain would be resting on the ground making it easier for a thief to use long bolt cutters with their bodyweight on one of the handles of the bolt cutter. What’s your opinion? Would a ground anchor affixed to concrete be still more advisable? A ground anchor means the chain is closer to the ground which makes it more vulnerable to bolt cutters for sure. Having said that, the Legend has 15 mm links which although theoretically crop-able, are very unlikely to be cut by even the biggest bolt cutters. Such croppers would also need to be wielded by a heavy man who knows exactly what they’re doing! Whereas, if a thief can cut a hole in your fence, with a bit of help, they could maybe carry all 4 bikes out without having to cut anything else. It’s difficult for me to make a judgement here as I don’t know what your fence is like or how big/heavy your bikes are. But I would perhaps tend towards the ground anchor to me honest. Thank you Carl. I suspected as much but thank you for your opinion on this! Again, great site and keep up the good work. It’s very much appreciated. wonderful guid and lots of information easy to catch. What are your thoughts about the C-shaped bike locks I saw in the Netherlands, that are attached to the frame under the seat? Frame locks. Yeah they’re good secondary locks. I will be writing about them soon. Great info! What do you recommend I use for locking two bikes (big dummy and road bike) to a garage floor secured kryptonite 16mm stronghold anchor bike lock? I’m open to using one lock or two separate locks. thanks! The Kryptonite New York Legend chain is probably the best choice here. Alternatively, the Kryptonite New York Fahgettaboudit or OnGuard Beast chains are also good, but won’t be quite as secure. All the locks are available in longer lengths, so securing two bikes shouldn’t be a problem. Well, they’re very cheap and the Catalyst you link to in the video is pretty secure. But they have a very bad reputation for reliability. So the mechanism starts to seize up and jam very quickly. 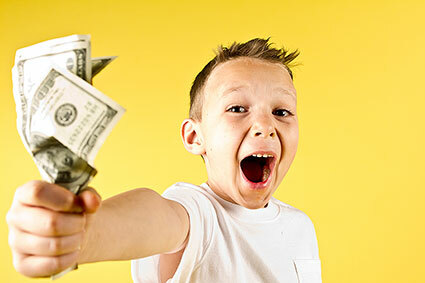 My advice is to spend a little more to potentially save yourself a lot of grief later on! Great site – thanks for your hard work helping us keep our bikes safe. I am looking for a lock for my kids, that is not too heavy for them to carry & not useless. Seems like a hard task, without spending £80. I do believe in investing in locks, and whilst their bikes are relatively expensive for kids bikes, that’s not quite proportionate. I have found this site https://rascalrides.com/best-kid-friendly-bike-locks/ and like the look of the Woom chain lock, but can’t see any Sold Secure rating. Have you heard of them? Or would you point me in the direction of other short / small locks that could be used by kids? This is good question and I should probably have a similar page! The Woom lock isn’t rated by Sold Secure. And 6 mm links aren’t very secure. However it depends on how expensive the kids bikes are and how risky your area and routines are. It’s a tricky one. Because it’s not just about security. It’s about making sure the kids know how to use the use the lock properly (and do so!). My sons had 2 bike stolen in the last 6 months and I’m always suspicious that it’s because he hasn’t locked them up properly! I would prehaps recommend the Kryptonite KryptoLok Series 2 955 Mini. It short, relatively light for a chain and easy to wrap around a seat post when your riding. It’s much more secure than the Woom. But maybe too much for your kids (depending on their age)? Parents with multiple children may be in a good position to experiment, and then report back to us here. It would interesting to give one child the KryptoLok Series 2 955 Mini, and give another child the Hiplok DX. After a few weeks of observation, tell us which child would rather use her sibling’s lock, and which lock appears to be more convenient from the perspective of the kids. Both options are rated “Gold” by Sold Secure. HipLok DX weighs 1.25 kg. 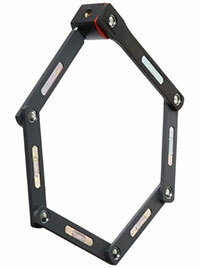 Kryptolock-2-955 is better for carrying on a bike frame. HipLok DX is better and faster for attaching to any bag or belt. Kryptolock-2-955 requires a thief to cut twice through 9mm steel. HipLok DX requires a thief to abrade through 14mm steel, then either bend it, or repeat. But, which lock is less trouble for the kids? The human is always the weakest link in a security system. People of all ages consistently reject any security measure which is perceived as too difficult. Don’t forget that wheels, saddles, and other components may be secured by relatively weightless and effortless Hexlox. The HipLok reviewed at thebestbikelock.com is the DXC model. This is identical to the HipLok DX model with a 1mm cable included, hence the somewhat heavier weight. Personally, I have no use for fussing with a cable, because my hex screws are filled by Hexlox, and I would not expect a child to use anything more complicated than my own system. As you say, the human is always the weakest link in a security system and this is especially the case with kids and bike locks. This is a subject very close to my heart as my kids keep having their bikes nicked! First, like many others, I would like to thank you for your very useful website! For example, you convinced me about the Hexlox system, which I am now using for my new trekking bike. Sorry about the delay getting back to you Heimo. I think, if you’re OK with the weight of those locks then obviously that’s fine. I think for some people that would be waaaaay too much though! People complain about the weight of their locks all the time. Of course most cyclists don’t use panniers either so your combination wouldn’t work at all for them (I reckon even you would feel that weight if you had the locks in a bag on your back!). I’m a big fan of the Skunklock concept, it’s good to see a lock coming at things from a different angle and I’ll definitely be reviewing it once it’s released. And I’m glad I managed to convinced you about the Hexlox: they are definitely my favorite bicycle security innovation of the last few years! Yes, that was my whole point: whether the weight of heavy locks really matters in real-world situations depends on whether the bike we look at has a bike rack or not. If there is a bike rack, than to use a pannier to store the locks properly while cycling can basically solve the weight problem. So I would encourage cyclists who have that option to give it a try – the alternatives I see would be either to pay a lot for an insurance (about 300 Euro per year in my town! ), or to increase the risk of theft significantly by saving on locks weight (which means, in most cases, to save on quality). Hi, thank you for writing up this article. It was immensely helpful. I have been using the Hiplok Gold to secure the front wheel and frame to a fixed structure. Recently, i have just bought a more expensive bike and intend to park it in the city for a few hours which is a high risk area. I have then invested in a Hiplok DX U-lock after reading your article. I like being able to “wear” the locks hence i went with Hiplok over Kryptonite. Both locks are Sold Secure Gold. I was initially going to lock the front wheel, frame and fixed structure with the chain and the back wheel to the frame with the U-lock. I usually have to lock my bike to a lamppost so won’t have the luxury of locking both wheels to fixed structures. Would you recommend this method of locking or should i be using the U-lock for the fixed structure and the chain for just the frame and the back wheel? It’s a tricky one. Obviously, ideally both the chain and the u-lock would be secured to the fixd object. Both of these are good locks. But the chain is more susceptible to bolt cutters. Therefore it’s important to keep it as far from the ground as possible. If you can acheive that with the lampost (whilst also threading the chain through the wheel) then your prferred method would be fine. Otherwise, (if as you say the area is high risk) I’d be tempted to use the U-lock on the fixed structure. Of course if you’re locking the bike to something that you can fit the DX around they’d be nothing stopping you putting the chain around the object too, no? I mean the chain is a good lock and you should be OK. But in my advice I’d prefer to er on the cautious side. Are there no purpose built bike racks in the area?